Isn’t this exciting? I am ecstatic about this and I do love a good old Eames! So for those that might be interested or would love to see this in action, or even buy themselves a new chair, get yourself down to this event over the weekend. The Conran Shop in Chelsea (81 Fulham Road, London SW3 6RD) is the place to be on the 14th and 15th October. 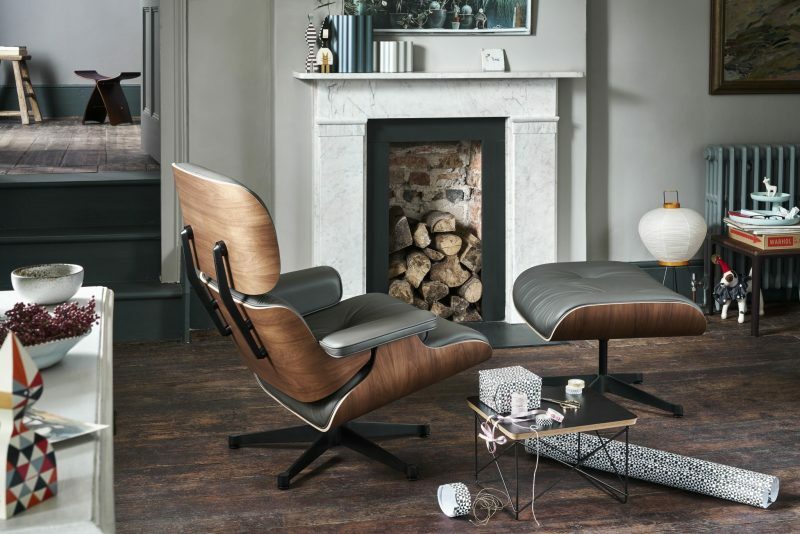 This October, Vitra will hold an exclusive event at The Conran Shop Chelsea, offering customers and design enthusiasts alike the unique opportunity to create and buy a personalised edition of the timeless Eames Lounge Chair and Ottoman in its most iconic version: black leather upholstery with a Santos Palisander frame. The pop-up Atelier event, which will take place on Saturday 14th and Sunday 15th October, is the first of its kind in the UK and aims to tell the story behind the world’s most famous chair by bringing its production to life. The Lounge Chair is one of Ray and Charles Eames’ most renowned designs and Vitra has produced it with the same care and precision for more than 50 years. In an open workshop at the Atelier event, customers will get the unique chance to ‘go behind the scenes’ and experience the true craftsmanship that goes into making each piece. This on-site assembly offers the opportunity to choose and see first-hand the exact materials being used, the individual production tasks and the sustainability of the design. Customers who decide to purchase an Eames Chair and Ottoman and have it made in the ‘Mobile Lounge Chair Atelier’ will become owners of a one-of-a-kind piece, exclusively engraved to show that it was made at The Conran Shop, and will be able to leave the shop with their purchase on the very same day. If you do want to ‘book’ to create your own chair then you can do this either by booking in-store, by email: eames@conran.com or by phone: 020 7589 7401. Places are limited so I would get in touch sooner rather than later. Founded by Sir Terence Conran in 1974, The Conran Shop has established itself as one of the leading lifestyle retailers in the world, offering an eclectic and handpicked collection of gifts, furniture, lighting and personal accessories from some of the world’s most respected designers and emerging talents. With its unique heritage, dedication to providing an unbeatable shopping experience and its carefully curated products, including vintage and modern designs, expert interior advice and personal services, The Conran Shop is the go-to place for any type of gift or interiors inspiration. The Conran Shop currently has ten stores across the world, three in London, one in Paris and six in Japan. Creating innovative products and concepts with great designers is Vitra’s essence. They are developed in Switzerland and installed worldwide by architects, companies and private users to build inspirational spaces for living, working and shopping as well as public areas. With its classics, Vitra represents ground-breaking 20th century design. Today, in combining technical and conceptual expertise with the creativity of contemporary designers, Vitra seeks to continue pushing the boundaries of the design discipline. I was right, wasn’t I? Did you book and get yourself a fantastically, lovely and iconic chair? Please share your photo’s, it would be great to see the chair in your home or office…. how have you styled it? This post has been written in conjunction with The Conran Shop, however no exchanges have been given or taken. Honestly Wonderful only work with Brands that they believe are in line with their aesthetic and promote products and furniture that they would like to use in their own spaces. If you would like any further details on promotional posts then please do get in touch at hello@honestlywonderful.com.